This is the date in 1393 when the Catholic patron saint of Bohemia, John of Nepomuk (or John Nepomucene) was tossed from Prague’s Charles Bridge into the Vltava River to drown at the order of the Holy Roman Emperor Wenceslaus. 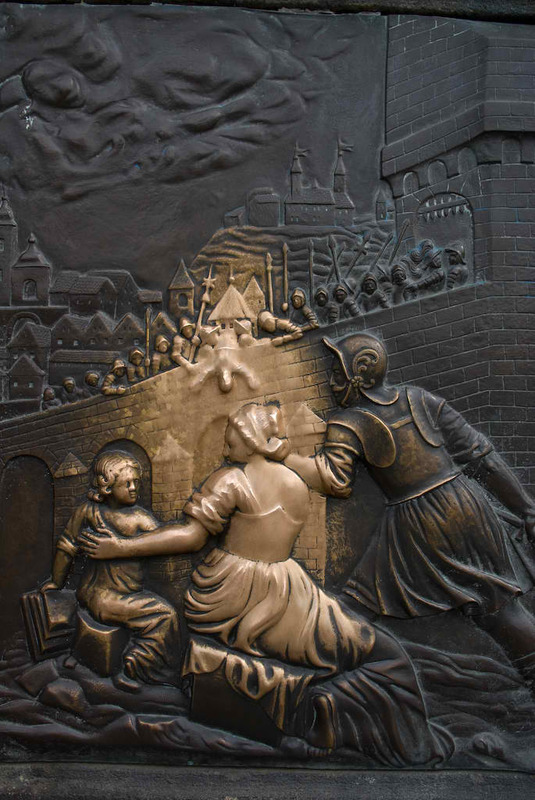 A relief detail ((cc) image from Charles Hoffman) on this statue depicts the moment of Nepomuk’s martyrdom. This Wenceslaus — not be confused with the good King Wenceslaus of song — had a tetchy relationship with powers ecclesiastical and temporal. But although Wenceslaus did martyr a fellow by the handle of John of Pomuk or Nepomuk, the latter makes this blog because of political tension centuries afterward. Despite the date of his corporeal death, John of Nepomuk is really a counter-reformation saint. Between the late 14th century and Catholic Austria’s bloody 17th century triumph over Czech nationalism the historical Nepomucene parted company pretty definitively. In the event, the latest manifestation of that disputatious relationship — the king’s attempt to seize some monastic revenues — caused Wenceslaus to completely fly off the handle and arrest several of the archbishop’s advisors, among whom was our sainted martyr. Wenceslaus personally oversaw their torture and ordered their drowning, but someone talked him out of the execution part. The king at that point had a sort of mini-Guantanamo Bay situation: he had in hand several people whom he had arrested arbitrarily and tortured, whose release would only further embarrass his own royal self. He therefore prevailed upon them to trade their silence for their liberty. This is a much more edifying martyrdom altogether, so little wonder that the sourcing on John of Pomuk over the succeeding centuries is a hot mess; later scholars would actually speculate as to whether there might not have been two priests of this name who were both martyred by Wenceslaus, so dissimilar were the legends. Nepomuk’s elevation to legend, and thereafter to the patron saint of Bohemia, would come in part thanks to a great Czech religious reformer who arose at the end of Wenceslaus’s reign — Jan Hus. This other, heretical John became woven into the emerging Bohemian national sense; he still remains there today. When the Catholic authorities beat back a Protestant and nationalist revolt in 1620 and imposed Catholicism from above,** Saint John of Nepomuk, martyr, was ready at hand for propagandists of the new order. At least, the legendary, confessional-keeping Nepomuk was ready … because this was not a job for the random cleric-bureaucrat who’d been done to death in some forgotten dispute over rent. 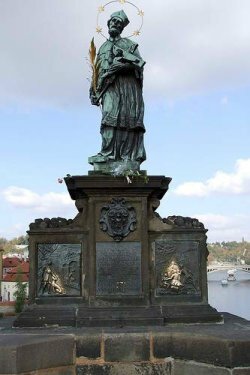 John of Nepomuk today is depicted in statuary on the Charles Bridge (the spot on the bridge where he was thrown over is also marked with a plaque) and is well-represented throughout Catholic central and eastern Europe. Owing to his patronage portfolios of bridges and flood victims, you might also find the Nepomucene in many a topical posting throughout the world — like the very spot of Christianity’s European triumph, Rome’s Milvian Bridge. * Wratislaw, “John of Jenstein, Archbishop of Prague, 1378-1397,” Transactions of the Royal Historical Society, Vol. 7 (1878), pp. 30-57. Wratislaw wrote a now-public-domain book about St. John available here. ** Bohemia’s Catholicization is perhaps the classic case in early modern Europe of the Reformation being rolled back from above and from afar. The recent (and none too affordable) book Converting Bohemia: Force and Persuasion in the Catholic Reformation takes a nuanced survey of Bohemia’s transformation from a Protestant to a Catholic bastion … and as the title suggests, finds many of the Catholic components home-grown. † R.R. Betts, “Jan Hus,” History, Volume 24, Issue 94 (September 1939), pp. 97–112.